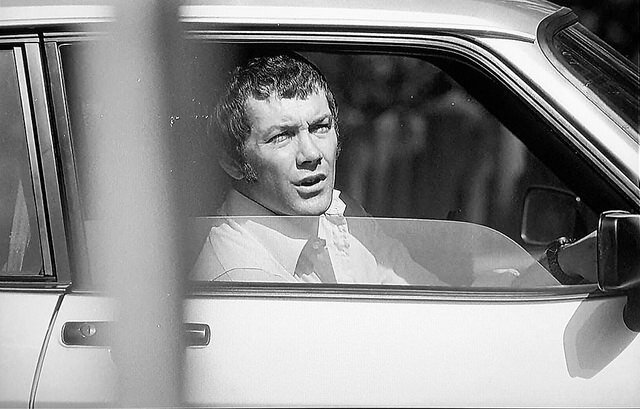 #398....."LEWIS COLLINS" - BODIE 3.7 . you'll never walk alone ! Something really grabs me about this pic, and I can't quite put my finger on what! This isn't the "don't talk to any strange men" scene, is it???? i will tell you what grabs me about this image, the open necked shirt and the look of him being hot in both senses of the word. This is a photo from the gallery shots on the new dvd's. Gorgeous isn't it. Think I've still got problems...this is in my messages, but not my feed - but it's a great squinty Bodie pic. oh cool, i hope you are now up to speed on everything, i love Bodie in the hot sun and look, look , look.....open necked shirt and a sense of feeling hot....yum. Got loads to catch up on, so I'll be back later to meander through the pics I've missed. Haven't been brave enough to try posting anything of my own yet - but at least my comments are working properly again ! please Enjoy at your own leisure. Hopefully, fingers crossed and everything else that your problem is fixed.About two weeks ago i came home one day, switched on my tablet only to find out that my lay out had been altered, apparantly i am now stuck with this new layout or i can view things in my own style through my journal. Let's hope it settles down for Easter. I wasn't well at the beginning of the week - so I'm just going to take it easy today. You never know what lj may have up their sleeves. I'm sorry to hear you have been feeling unwell, take care and a pleasant weekend to you too. i think i have had that problem before because lj has removed you from my friends list and i didn't know anything about it. This time they have changed my lj layout and again i didn't know anything about it. It takes other things out of my friends feed too - I lose prosfinder every now and then. I've made it part of my Lj housekeeping routine to check my profile settings every few months. It's harder to see with things that don't post very often, but ali15son posts so regularly it's really easy to spot when her journal goes walkabaout - like today! i am always losing things and i think this is twice now that the way in which i view lj has been changed without me knowing. Another completely new photo I've never seen before and it's a fantastic one! Cheers for this. What a nice shot. I think he's looking with whom Doyle is chatting and he is not amused. thankyou, perhaps he is looking out at Doyle but cannot see him because of the sun in his eyes. You are welcome and i love your post with the moon and the stars, very romantic. You have got your new dvd-box ? Did you find a lot of new pictures ? this image isn't from the new box set, it's from my blu ray box set. Thankyou for liking it. Yes i did order the new box set and no those pictures are not on it but it will be nice to keep it as part of my collection.